large opening and an integrated mesh drain panel. 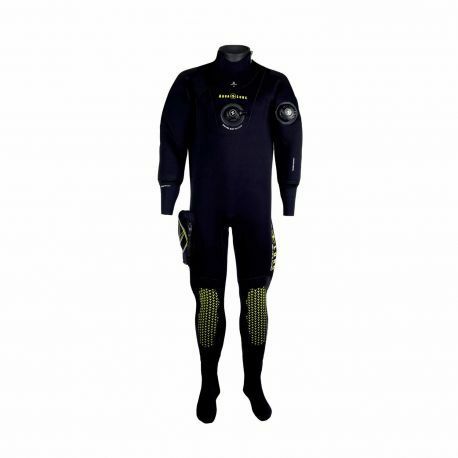 The dry suit is constructed with compressed 4mm neoprene to limit the extra buoyancy and keep its thickness even at depth, and it comes with comfortable suspenders . The Blizzard is available with integrated socks. Environmentally friendly features: neoprene free of P.A.H. (Polycyclic Aromatic Hydrocarbons), made from a non-petroleum based material and has REACH (European Union standards) approved thread. The neoprene is now produced with recycled black carbon. Compressed 4mm neoprene used on the entire suit gives warmth, keep its thickness even in deep dives and limit any excess buoyancy. Taped seems on all the inside for water blocking integrity. Non-slip prints on shoulders helps to keep the BC shoulder straps in place. The improved Powertex reinforcement panels allow increased flexibility while offering excellent abrasion resistance. The separate hood offers a face seal to limit water entry, and our G2 Vent Technology allows any trapped air bubbles to exit while keeping cold water out. The new cargo pocket offers a wide opening and a mesh bottom panel. Elastic suspenders including a 3D mesh back pad and a neoprene chest pocket for personal gear.